If you use the HubSpot Integration, you most likely have properties there that you'd like to attach in Drift that are not there by default. These properties are important for your sales or marketing teams so you can create workflows in both Drift and HubSpot and to make sure that you're keeping all of the data on your prospects constant throughout your tech stack. 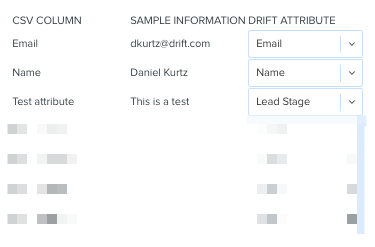 If you are just getting started with Drift, you can upload a CSV of contacts that are assigned a certain attribute in the CSV. If you are already a Drift user and are looking to add custom attributes to your workflow now, you can skip this section! The HubSpot Integration is available on our Pro Plans and above. Head to the Contacts view, select "Manage contacts", and click "Upload CSV." On the next screen, drag and drop your CSV into the grey window or click "Select a file." Once you've imported the CSV, you'll see a table appear with your CSV columns and the Drift Attribute to which you'd like to map those columns. Select the desired attributes and sample information will populate in the middle under the "Sample Information" column so that you can double check everything is lined up properly! Make sure you always include an "email" field to map into Drift or your upload will fail and return errors. We can't update information unless we know whose info it is! When you've finished mapping your attributes, make sure you click "Finish." 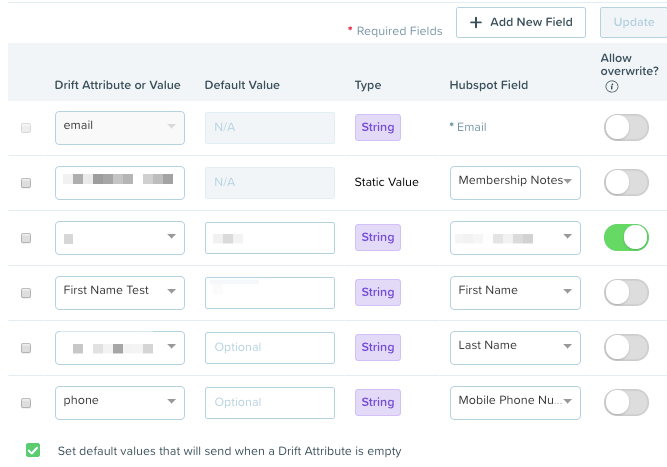 Once you've created a new attribute, head over the the HubSpot settings, head to Settings > App Settings > Integrations > Hubspot, or just click here! From there, find the Mapped Hubspot Attributes section. Here, you can select the Drift value that you'd like to map to a Hubspot value! To map a Numeric value in Drift (like CQL score), use the Calculated field in Hubspot! You can also write in your own Static attribute as well - this be the value that passes over for every record. A common use case would be mapping the text "Drift" to the Hubspot "Lead Source"
Careful you're not mapping to a "Read Only" field in Hubspot or that Hubspot doesn't require a specific format. Organizations may want to see which playbooks are creating the most leads in Hubspot. Below is a tip on how you can manage this with attribute mapping! When editing each playbook, head over to the Goals section and find the Bot Qualified goal. Here, you can create a new goal for when a lead is qualified by each individual playbook. For this example, we would add Home, Pricing, Products, and Support Qualified goals, instead of Bot Qualified goals for all four. 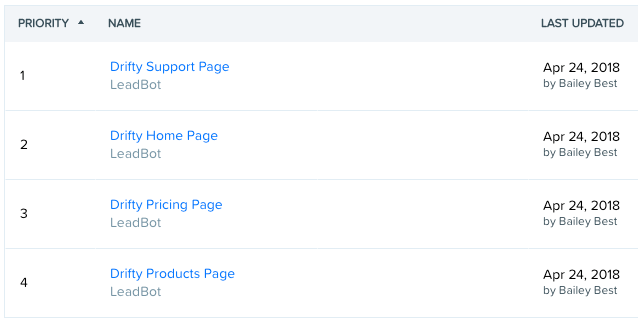 Then, you can go to the Integrations section under Settings and map the Lead Stage to Hubspot! This will cause Leads added to Hubspot to have a tag relevant to the playbook they engaged with.